Make a run on HQ. If successful, instead of accessing cards, you may force the Corp to lose up to 5credit, then you may gain 1credit for each credit lost. It's Account Siphon again, what more do you want to know? 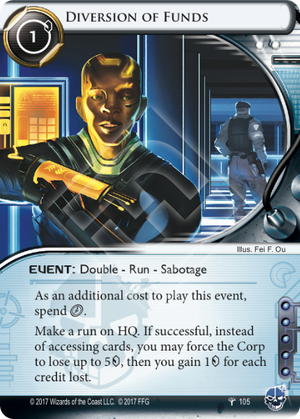 The additional cost of a click and a credit to play, plus the full 5 influence it now costs makes this a criminal card through and through, and without the tag "drawback" it lacks the synergy with Counter Surveillance decks. Honestly though this is just a much better, balanced version of Account Siphon. It still does the most criminal act there is: directly stealing money from the corp, but with less of an economic swing, and the implied cost of having to remove tags has been converted into a simple extra click. There's not really much else to say. It's a good corp-manipulating, economic card. If you were around pre-rotation you already know this. Otherwise, you're about to find out why you always defend HQ turn 1 against criminals. The Shadow Net: For every agenda and Fan Site in your score area you get to play one of these like old times. Ixodidae and Amina: Draw every last credit you can out of the corp.
Comet: Play 2 for 3 clicks. Encore: If you can pull it off, you get a whole turn to play two of these babies. Same Old Thing, Trope, Levy: Someone make this happen again.